Charter schools & Moral Bankruptcy. You are here: Home / Misc. / Education / Charter schools & Moral Bankruptcy. (ThyBlackMan.com) People who follow politics, even casually, learn not to expect high moral standards from politicians. But there are some outrages that show a new low, even for politicians. Among the consequences of Democrats‘ recent election victories, especially at the state and local levels, is the election of officials who have publicly announced their opposition to charter schools, and their determination to restrict or roll back the growth of those schools. From the overall situation you have statistically described in this article, charter schools may be the gateways back to segregated schools, but don’t get me wrong,I graduated from a segregated high school in the deep south and went on to meet with great success in America. Segregated public education schools were in many ways just like charter schools of today. When I was in high school the emphasis was on trying to prove to whites that the students of this all black high school, using motivated black teachers,antiquated, hand-me-down books, and other equipment from white high schools, were just as smart, and educated enough to compete with all other members of American society for good jobs in every walk of American life.Segregated schools were partially successful leading into a scholastic flux that came with integration and the continued fulfilling of the Thirteenth,Fourteenth, and Fifteenth Amendments to the U.S. Constitution. Politicians’ unwillingness to support charter schools in favor of public schools may be viewed as a-moral behavior, but we must consider our overall political structure which discriminates and caries its own a-moral code in many different ways.If you are predicating your definitions of moral behaviors on christian ethics, then it can me argued that the American political system is completely a-moral.We vote to elect representatives despite their religious beliefs,We submit to the decisions of an electoral college despite of their religious beliefs, and we elect and agree to the election of a president and a congress despite the religious beliefs of these elected officials. 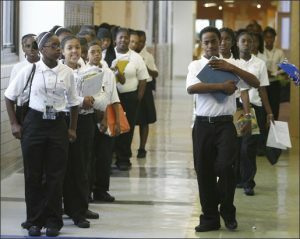 I am one who weighs and evaluates the utility of public and charter schools and am not convinced, especially given their performances after integration, that public schools should reign supreme.I think that we better educated black children during segregation than we have during integration. Our educators should speak to these deficits in education between whites and Hispanic,and black. Where is their dedication to educating all of our children today ?